1.1 The objective of these "standards" is to ensure that the important parts of your module (dimensions at the module ends, module construction materials, leg height, module deck, track power buss, etc) are compatible with other modules. What you do with the rest (track plan, scenery, structures, etc) is up to you so long as it has similar features (and that can be widely interpreted) as the other modules. Remember, the objective of the Dirty Thirty On30 Module Gang is to showcase our modeling skills, maybe do some operations, run some trains, learn new skills, make new friends, enjoy ourselves, and......... above all............. have some fun!!! So, let's get started. 1.2 The height of the module from the floor to the top of the rail (including the travel of the leg leveller) is 45” at the module interface. 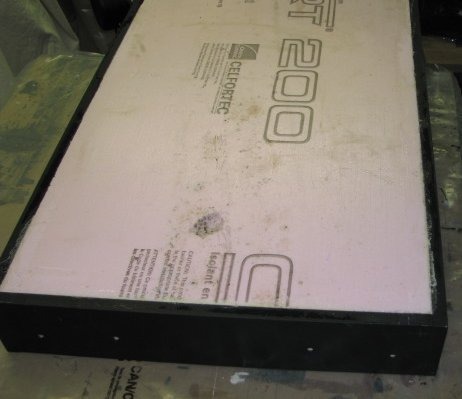 1.3 Modules are built on a wooden frame with a 11/2" or 2" Styrofoam deck. 1.4 The width of the framing materials can range from 31/2" (1"x 4" nominal) to 41/2" (1"x 5" nominal) using knotty pine or plywood. 1.5 The ends of each module are built of dimensional lumber or plywood so that the end of the module is 24" wide, 3/4" thick, and 31/2" to 41/2" deep so as to be compatible with neighbouring modules. The 3/4" thickness is to allow for a clamping surface that will rigidly hold the two mating modules together without bending the module frame. The 24" width is made up of an end-plate that is usually 221/2" wide with two side frames that are each 3/4" wide (221/2"+ 3/4"+ 3/4" = 24"). If the side frames are less than 3/4" thick, the length of the end-plate is adjusted accordingly to allow for a 24" width. 1.6 To allow room for C-clamps, keep the inner surface of end plate clear of obstructions (electrical wires, LocoNet, etc.). 1.7 The length of a module is limited by what you can fit into the back seat or trunk of your car. A 6' long module will obviously NOT fit into the back seat of a sub-compact. 1.8 A 3/4"x 11/2" middle cross member is recommended for the underside so as to provide additional support. It also serves to keep track buss and LocoNet wires from drooping down. 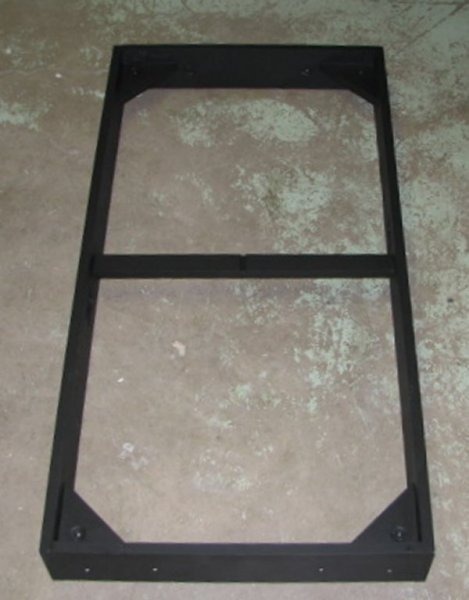 1.9 All surfaces of the module frame must be painted flat black so as to prevent moisture absorption, and to have uniformity of look amongst club modules. 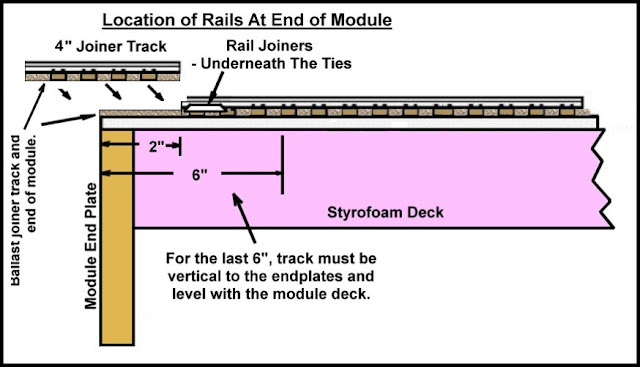 2.1 Modules have a complete deck made from 1 1/2" or 2" Styrofoam. 2.2 There are no gaps in the deck that are open to the floor. 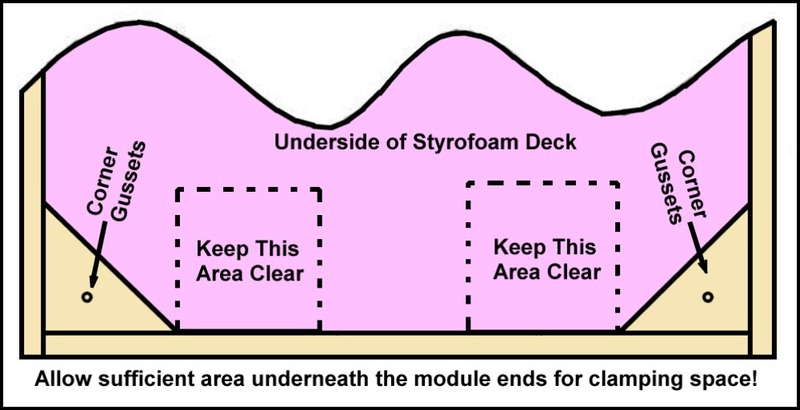 2.4 When the Styrofoam has been glued to the module frame, the gaps on the top of the deck between the frame and the Styrofoam should be filled with Spackling compound, sanded and smoothed so as to provide a seam-free deck. 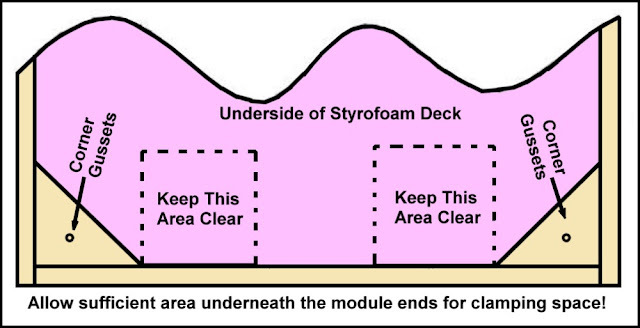 The top of the deck should then be painted brown so that none of the pink, blue, or green of the Styrofoam is visible. 3.1 Module legs are 11/2" x 11/2" lumber (2"x 2" nominal spruce). 3.2 A standalone module should have 4 legs so as to be able to stand on its own during set-up and take-down. 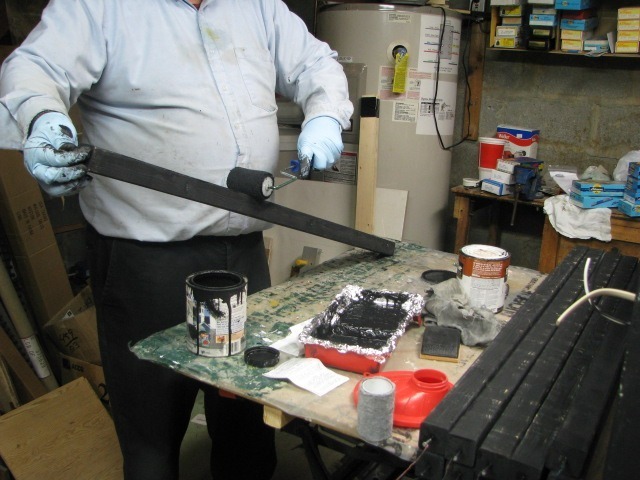 3.5 Legs are painted flat black with the top of each leg marked with the owner's and/or module name. 4.1 Power needs to be distributed from module-to-module from a central command station/booster and into the tracks in a very reliable manner. Nothing is worse than having a train go through fits-and-starts because of poor wiring. Therefore power distribution between modules and the tracks is of the utmost importance. 4.2 A 2-wire central track power buss should run from one end of the module to the other end of the module. The buss should terminate in the middle of the module ends, clear of the clamping area referred to in 1.6 above. 4.3 The two-wire track power buss must use 14 AWG wire, preferably in 2 different colours so as to ensure that the wiring is done properly. Select two contrasting colours (eg white-and-black, or red-and-yellow, etc) and use this "colour code' throughout your modules. 4.4 The two track power buss wires must be twisted together. No exceptions! One twist every 6"-8" is sufficient. 4.5 Solder all wire connections! Terminal blocks, suitcase connectors, brass-screws-in-the-ends-of-the-module are not allowed! We want 110% reliability so that voltage drop within and between modules is minimal - zero!! 4.6 We don't want any loose wires hanging down underneath the modules. 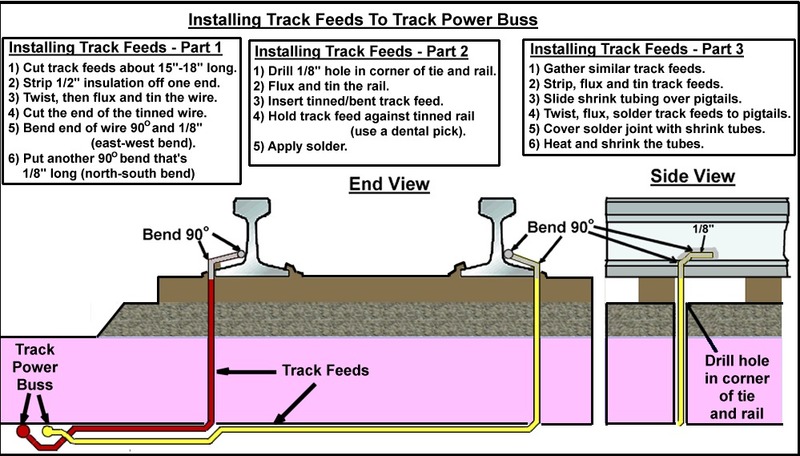 Make sure the track power buss is anchored at each end (use "Bell wire" staples), in the middle (run it through a notch in the middle cross-member, and throughout (use gobs of polyurethane glue to glue the wires to the underside of the module). 4.7 In order to pass power from one module to the next, 30-amp Red/Black Anderson Powerpole connectors are crimped on to the ends of the track power buss. When you are facing the endplate of your module, the Red connector should be connected to the Right hand rail as seen facing the end plate. The PowerPole must hang down at least 6" below the module so as to connect with the adjacent module. 4.8 This means that, when you plug your module into the next one, your Red connector will plug into the Black connector of the adjacent module and your Black connector will plug into the Red connector. 4.9 Connectors MUST ALWAYS be connected Red-to-black, and black-to-red. 5.1 Track feeds should be no smaller than 22 AWG. (As the AWG (American Wire Gauge) number increases, the thickness of the wire decreases. Thus 22 AWG wire is thinner than 14 AWG wire). 5.2 Track feeds should be dropped every 2-3 feet. As a minimum, separate track feeds should be dropped from each end of the module. 5.3 Track feeds must be soldered to their respective rail and to the track power buss. Again - no mechanical connections (no terminal blocks, suitcase connectors, brass-screws-in-the-ends-of-the-module). 5.4 "What's a pigtail? ", you ask. For the answer, check out this post on module construction. 5.5 For every turnout, there has to be a track feed no less than 2' before the point rails, a track feed within 2' of the mainline track beyond the frog, and a track feed within 2' of the diverging track beyond the frog. 5.6 Insulated gaps must be incorporated into the turnout on the mainline and diverging rails or the frog must be insulated. 6.1 An important part of Digital Command Control (DCC) is the data communications system between throttles, radio and infrared transceivers, and the command station. While this part refers to the Digitrax LocoNet system, this standard is also applicable to other systems such as North Coast Engineering (NCE), Lenz, and others. 6.2 Commands between throttles and the command station are carried over a physical data network that is comprised of 6-wire RJ12 telephone cable and components. We will refer to this as the "LocoNet. LocoNet uses 6 coloured wires (white, black, red, green, yellow, blue) in telephone cables, jacks, plugs and other components. Each wire performs a different function in the LocoNet system. While each manufacturer's protocol may vary, further details of these functions and the data communications protocol can be found in the document "LocoNet Personal Edition". This will provide the reader with an appreciation of the sophistication of a DCC system and its relationship to computer data communication standards. 6.3 A 6-wire telephone cable runs from one end of the module to the other end of the module along the shortest possible route. A minimum of 6" of cable extends from the end of the module. 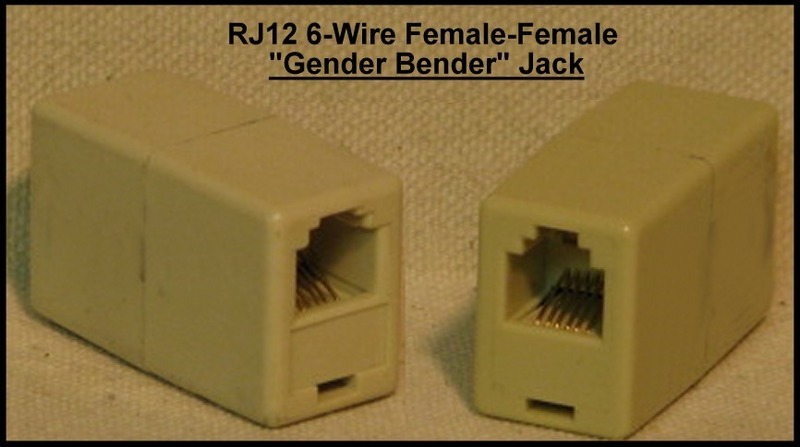 The cable at each end of the module terminates in an RJ12 6-wire male plug. The cable hanging from the end of the module is kept in place with a Bell-wire staple. 6.4 The LocoNet buss is connected between modules with an RJ12 6-wire female-female "gender bender" plug. (Wherever possible, these should be "data style" plugs where Pin 1 at one end connects to Pin 1 at the other end, Pin 2 connects to Pin 2, etc.) These plugs will be supplied by the club. 6.5 A 6-wire telephone jack can be installed in one or both sides of the module so as to provide a plug-in for throttles. 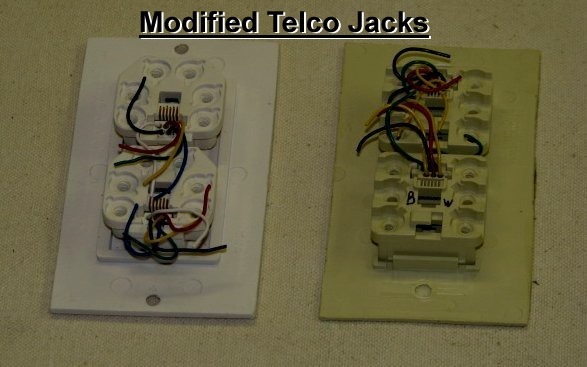 In such a case, the telephone cable referred to in 6.3 above runs from one end of the module directly to the nearest telephone jack, (then directly over to the other telephone jack) and then directly to the other end of the module. All connections must be soldered and covered with shrink tubing. Colour coding is maintained for all connections - that is, white-to-white, black-to-black, red-to-red, green-to-green, yellow-to-yellow, blue-to-blue. 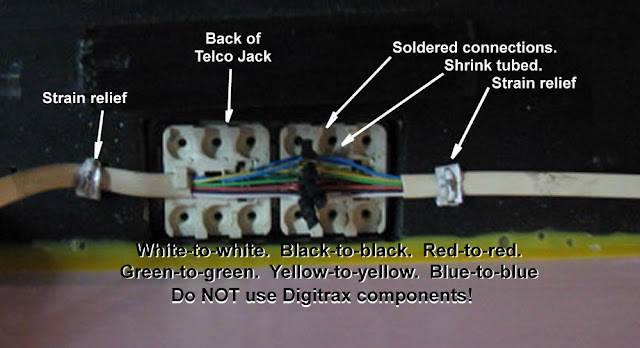 6.6 Digitrax components such as UP3/5 panels, UR90 infrared receivers, UR91/92 radio transceivers, Loconet Repeater Modules, and other such devices are NOT to be installed in the module! 6.7 Telco jacks, right out of the box, will take a big chunk of thickness out of our side frames - as much as one-third of the thickness - ie 1/4". In addition, the full size will detract from the look of our module. To learn how to trim the telco jack so that it's slim and trim and looks like the photo below, click on this link. 7.1 Track is centred in the middle of the module at the module ends (ie 12" from the edge of the module to the middle of the track) and 2" from the end. 7.3 We'd also like you to ballast right up to the edge of the module and ballast the joiner track. It greatly adds to the look of the module. 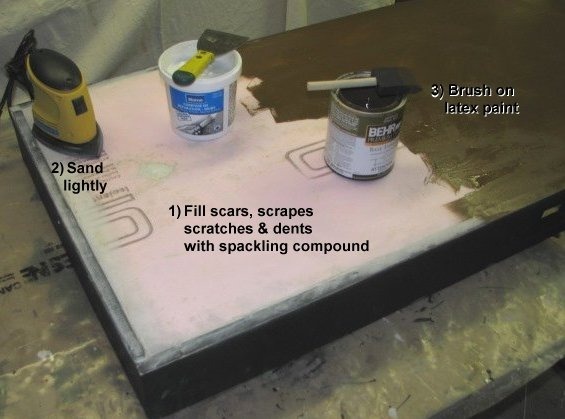 (Thinly spread some epoxy on a piece of white paper so that you can place several joiner tracks on the paper. 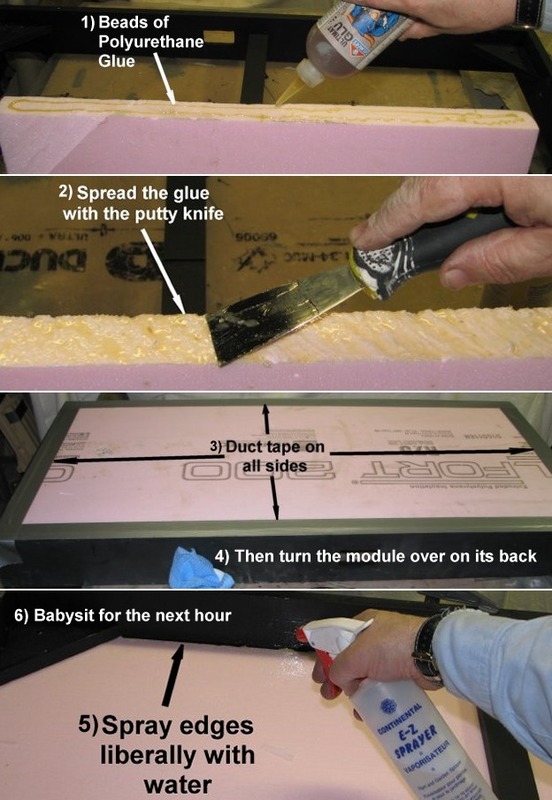 Leave enough space between the joiner tracks so that you can cut apart the paper when the epoxy has set. Voila! You now have a base on which to apply ballast to the joiner track. 7.4 For the last 6" before the end of the module, your track should be nice and level. After that, your track can rise and fall as you wish. Just make sure there are no "ski-jumps" or "S-curves" as you transition from the straight and level to the beginning of the grade. 7.5 From one end of your module(s) to the other, the track is free to meander up-and-down and from side-to-side in order to create the scene that you wish to make. Mainline track should be no closer than 4" from the edge of the module. Grades should be constructed so that uncoupling doesn't happen when you go over the top of the hill or when you come down at the bottom of the hill. 7.6 Mainline rails should be Code 83 flex-track or handlaid track; Micro-Engineering, Peco or other brands. The choice is yours. Tie spacing, however, must be On30. Code 70 may be used but you are responsible for supplying a 4" joiner track that will connect your module to my module. 7.7 Minimum radius is 26" but broader curves are desired with appropriate easements. 12" of straight track is required between reverse curve sections on the mainline. 7.8 Mainline turnouts shall be no smaller than #5s. #4 turnouts may be used if the primary route takes the straight leg of the turnout. If commercial turnouts are used, see Section 5.6 above for the wiring standards. Handlaid turnouts must have insulated frogs that are powered. 7.9 NMRA On30 clearances must be used for all trackwork. To join in on the discussion on our Facebook Group, click on this link.